Everything The O.C. : The O.C. Memorabilia: Benjamin Mckenzie's before fame drivers license! The O.C. Memorabilia: Benjamin Mckenzie's before fame drivers license! 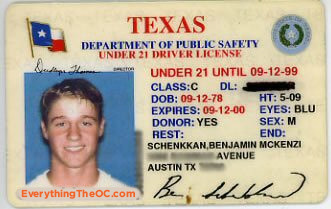 As you can see this is Benjamin Mckenzie's before fame drivers license from when he lived in Austin, TX. Notice how his last name is Schenkkan, this is Ben's real last name but he chose his middle name "Mckenzie" for acting. Ben is shown as 5' 9" which is very cool for all you average Joe's out there, you don't have to be tall to be "big"! On a side note - Ben has managed to take a near perfect drivers license picture which we think is hella rare! Furthermore he was a heart donor, how generous! Who would have thought he would end up breaking a lot of hearts in the years to come! Learn a whole lot more awesome things about Ben before he was famous here!